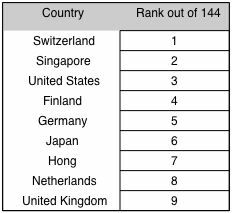 The Global Competitiveness Report for 2015-2016 has been prepared by the World Economic Forum as an indicator of the relative economic performance of 144 countries. We have concentrated on the strength and weaknesses of the relative rank of the USA. The relative rankings should be seen in the context that the recent (2005-2014) total productivity growth has been negative with the exception of India. IMPLICATION: The recent negative growth in productivity has depressed the growth in GDP and therefore the growth in stock market valuations. 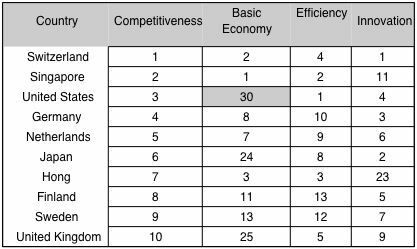 IMPLICATION: Although the US leads in efficiency and in innovation, the basis economy is lagging - e.g. is mature and is not attracting investments. The contributing factor to inferior performance of the basic economy it the economic environment. talent. 3. Excellent education system at all levels. 4. Efficient labor market, with high levels of collaboration between labor and employers and employee protection. 5. Public institutions are effective and transparent. 6. Competitiveness is further buttressed by excellent infrastructure and connectivity and highly developed financial markets. 7. Stability that is superior. IMPLICATION: The inferiority in the economic environment and in health, education account for the prospects that the market position of the US will be deteriorating. There are also human capital factors that explain a country's competitiveness. The table below shows how and increased influence of negative effects will depress its competitiveness. IMPLICATIONS: The decreasing ranking on the quality of math and science will continue to offset other favorable tendencies, such as the US superiority of retaining talent, which refers particularly to immigrants.